Full athletic scholarship for gymnastics. Major in journalism with minors in Spanish and communications. I chose journalism because I absolutely love to write. I also enjoy working interpersonally and communicating with others to accomplish goals. How did you learn about NIU, and why did you choose to attend? I learned about NIU because I am from Gurnee. It was a school that was closer to home. I was also offered a scholarship to NIU, which opened the door for me to attend the university. 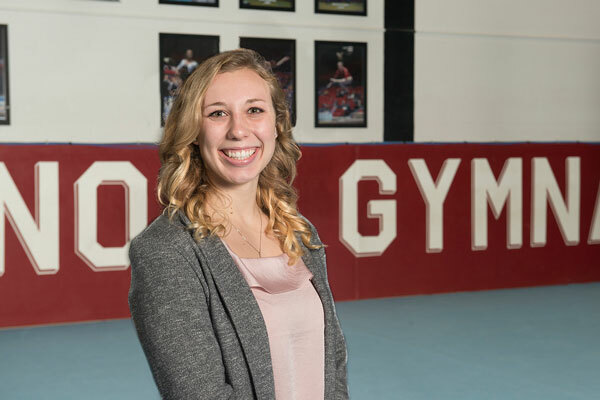 I ultimately chose NIU for the variety of majors and classes offered, as well as the opportunity to compete for an NCAA Division I gymnastics program. I am a member of Athletes in Action, which is a Christian student athlete organization. We meet every week to talk about the gospel and learn about Jesus. In my spare time, I really enjoy painting, baking, photography and reading. What has been your favorite event at NIU, and why? My favorite events at NIU have been the athletic events that go on throughout the year. I really enjoy watching football, volleyball and baseball games. I love how close-knit the campus is. It is not very large, and everything is in walking distance. It makes the campus and community feel like a family and home environment. I love the small-town feel of the community. I enjoy how the outside members of the community are proud and happy to support NIU. What has your experience inside the classroom been like at NIU? My experience has been very good inside the classroom at NIU. I have taken a lot of broadcasting classes, which have allowed me to be interactive and to really understand what it’s like to be a reporter in the real world. NIU is a very diverse community. I feel that I have learned so much about other cultures and ethnicities and will be able to communicate and work effectively with other people of all different backgrounds. I feel like I will be able to develop personal relationships with a lot of different people. Would you recommend NIU to others and why? What’s a general piece of advice you’d give to someone starting college? I would recommend NIU to others because of the incredible care that the university has for its students. I would tell someone starting college to really enjoy it. The ultimate goal is to graduate with a degree, but stop and step out of your comfort zone and do something unexpected to really get the full college experience. Any family or other loved ones you would like to mention? My fiancé Ryan Graham and I are getting married in June 2019. My mom, Paula, and my dad, Dennis. My sister, Lyndsey, and my brother, Joel. What is your favorite place to hang out in the DeKalb area and why? I love hanging out or studying in the DeKalb Public Library. It’s beautiful and peaceful. I also really love the Lincoln Inn breakfast place. I go there often for breakfast with a lot of my friends. Emily Basara, a May 2019 graduate, was a 2018 Lincoln Laureate nominee.